First off, you need a 5 quart crockpot, a sturdy spoon or spatula, parchment paper, cookie sheets, a scoop, and a little over two hours. For ingredients you will need 34.5 oz of honey roasted dry roasted peanuts (**My note: Larry said that he doesn’t like the flavor of the honey roasted in the peanut clusters, so I’ll definitely be using plain dry roasted from now on), 32 ounces of vanilla flavored almond bark (in the baking supply aisle and contrary to the name doesn’t have any nuts), 12 ounces semisweet chocolate chips, and 4 ounces Baker’s German Chocolate bar (found near the almond bark and the bar itself is the full 4 ounces). Now, I’m going to admit that this is where things started going wrong. 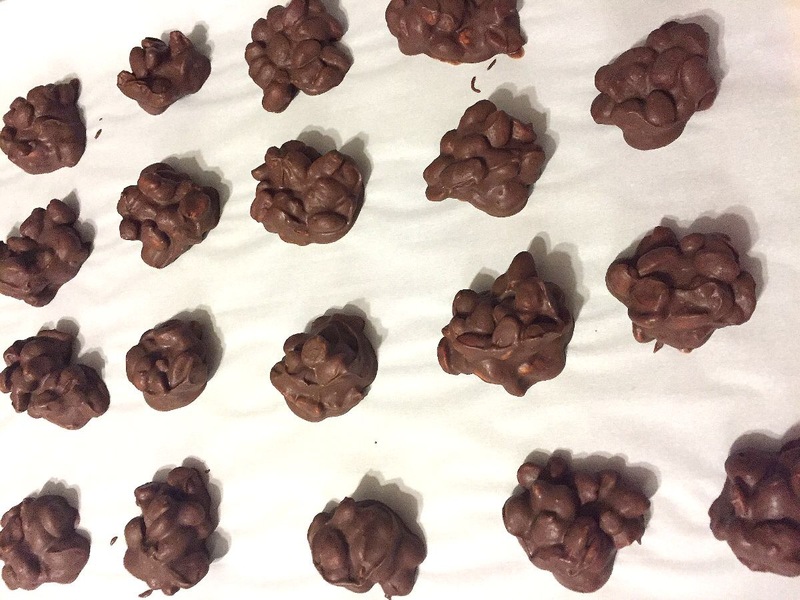 We were trying to make the peanut clusters and another candy at the same time, and ditched the other one because so much was going wrong, but found that there was a snafu with this one too. It was the first time I had bought or used almond bark, so silly me didn’t pay attention to the size and notice that the recipe would need part of a second package, so instead I compensated for the missing eight ounces of almond bark by adding that much more of semisweet chips. I liked the results, so I’m not sure that I’ll do it the correct way the next time I make this, but I want to be honest about what went on in case you have the same problem or want to go that way. Pour the peanuts into the crockpot – it will seem like there’s an insane amount of peanuts in there, but I assure you, you’re doing it right. Next is one key tip that the original didn’t mention. Before layering the almond bark over the peanuts cut that bar up!! I can vouch that the blob of almond bark may soften, but won’t fully melt in the allotted time, so cut it on those scored lines please. You will have a very hard clump that you’ll have to pull out of the pot, chop up, and put back in, all while trying not to make a huge mess, which is nearly impossible, if you don’t chop it at the beginning. *sigh* Anyway, lay the bits of almond bark over your peanuts, and then scatter the chocolate chips over that. Next is the Baker’s bar, which will melt just fine without cutting (it isn’t nearly as bulky as that bark *grin*). Put the lid on it, turn the crockpot to low, and walk away for one whole hour. Don’t stir, don’t lift the lid to peek, nada. Dance around that Christmas tree, pull the cat out of the said Christmas tree, or fall into the black hole of Facebook until your alarm goes off. Whatever floats your boat, but hands off! Now you can stir and look how yummy it all ready looks! 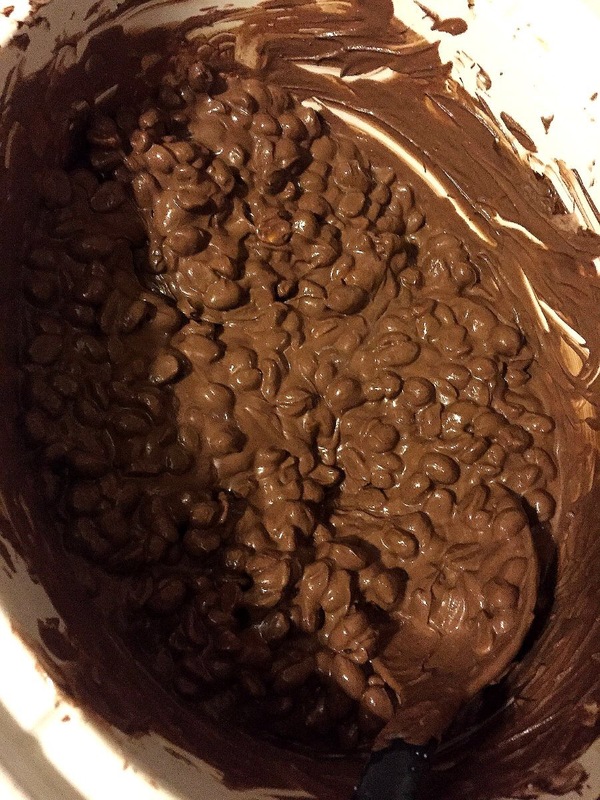 Put the lid back on, set the alarm for fifteen minutes, and stir the mixture every fifteen minutes for an hour. It won’t be the prettiest girl at the prom, but it’ll be the one with all of the personality, so don’t worry if the sides look a bit icky like mine. After the hour of stirring intervals it’s time to scoop. The original recipe just calls for laying out parchment paper, but I don’t have a very big kitchen with tons of cabinet space, so we lined cookie sheets and swapped them out. 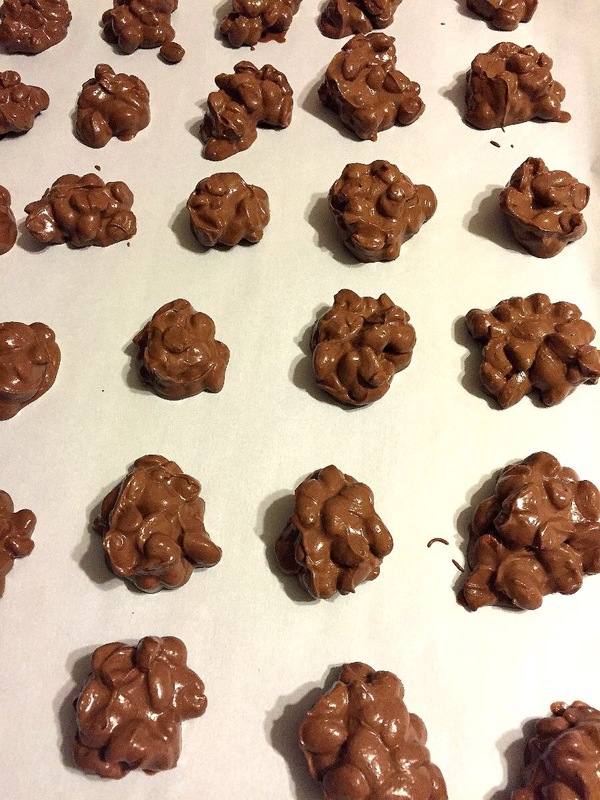 I tried one batch without a cookie sheet and it was pure misery with some of the candies oozing together into big blobs when I tried to move them a little, so I strongly recommend cookie sheets. 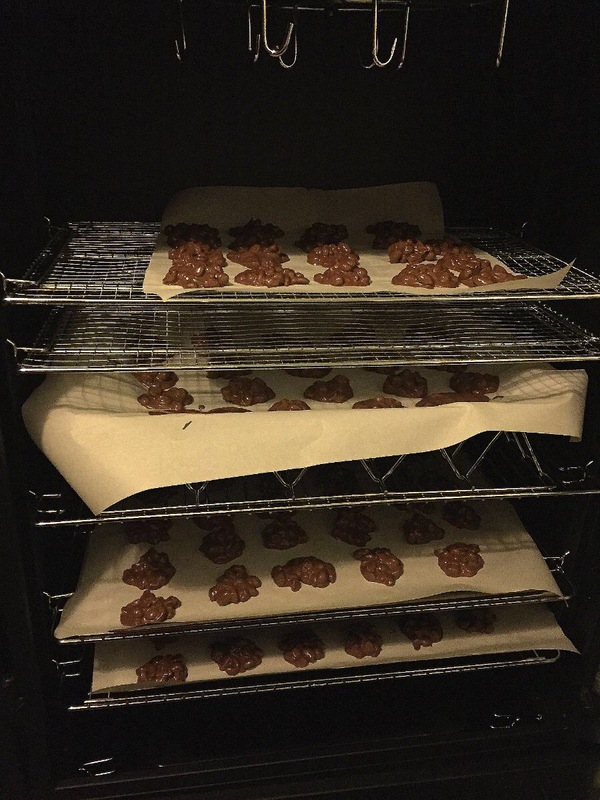 The flat AirBake sheets worked best for us. Now, I have no idea what makes parchment better than wax paper for these, but I didn’t want to risk trouble by experimenting to figure it out. Parchment paper it is. *grin* Don’t forget to turn off the crock pot! If it’s really cool in your kitchen you can keep it at warm, but you’ll have a little trouble with the mixture staying runny once you get to the bottom. That’s better than a solid mass though, so I’d definitely do it if I felt it was necessary. You just don’t want to keep it on low the whole time you’re scooping. 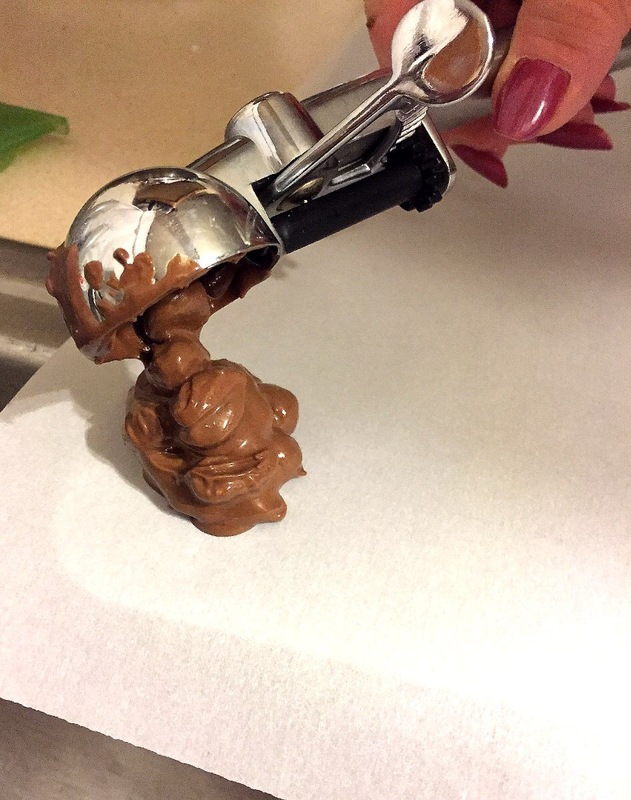 We used a tiny cookie scoop for scooping the peanut clusters. While the mixture was fresh and hot, it was more runny and didn’t need the little sweeper arm. As the mixture set up a little more the little arm was quite useful. Make sure to drop the scoops apart from one another. I left them to cool for about four hours and then brought them in. They were good and hard, so I was able to pop them into some zipper bags, and fit those bags into the remaining gaps in the refrigerator then. Even with samples left out (or happily melting in our bellies) I filled an entire gallon bag and a quart bag! Oh, by the way, don’t forget to let these chocolates sit out at room temperature for a little bit before serving, since you don’t want anyone to break a tooth on cold peanuts. Those suckers are hard when they’re cold! Hopefully this little feature for Serve It Sunday will help if you’re looking for one more item to round out your Christmas dishes. These would also make a great gift, since it’d be easy to put the clusters into decorative mini muffin or candy liners, and then into a festive cellophane bag. The recipe is easy enough that you could cook dinner while it’s melting, too. Just don’t try to make a complicated dessert while making these for the first time. *laugh* They are so worth giving a shot and the original blogger even added decorative candies, so there is a lot of room to put your personal touch to these. 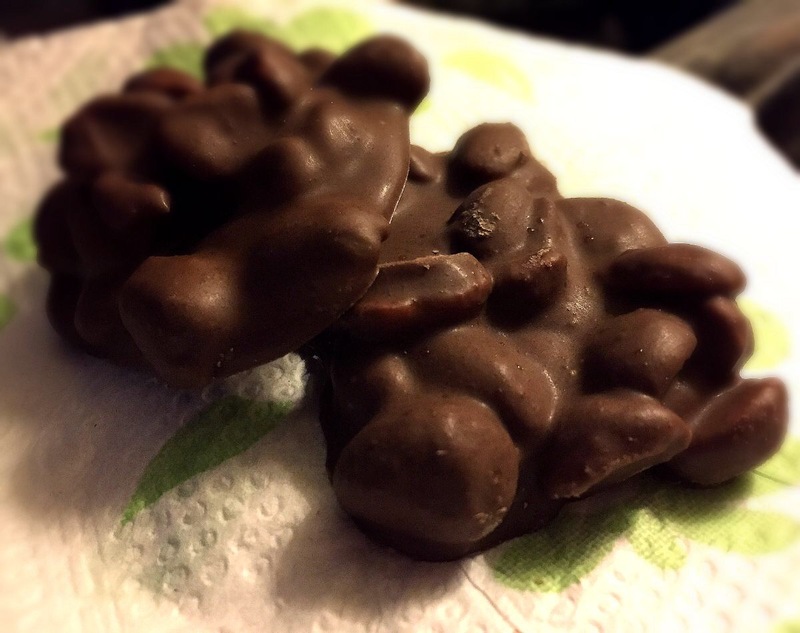 Posted in Recipes, The Holidays and tagged Christmas Recipe, Crockpot, Easy Recipes, Peanut Clusters, Recipes. Bookmark the permalink. Thanks for sharing this recipe. Happy to learn from your experience & the photos make it easier to follow along. Photos also look yummy, encouraging me to make these! I’m so glad that the post encouraged you! Hopefully your attempt goes smoothly and that you have a wonderful holiday. Thank you for reading and for the feedback! Hey, I went through your blog and simply loved ‘Cherry Chiffon’. Thank you! I appreciate the link and the opportunity to learn about a yummy blog that I didn’t know about. Awesome!